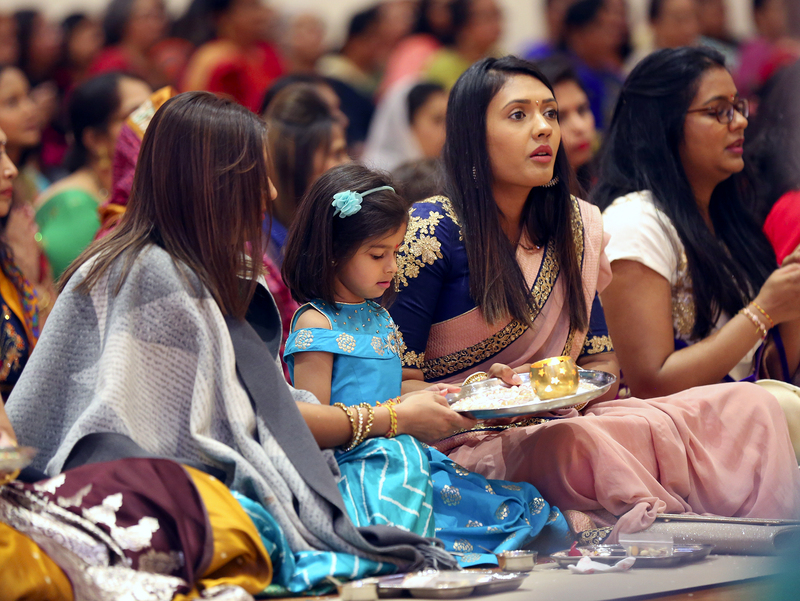 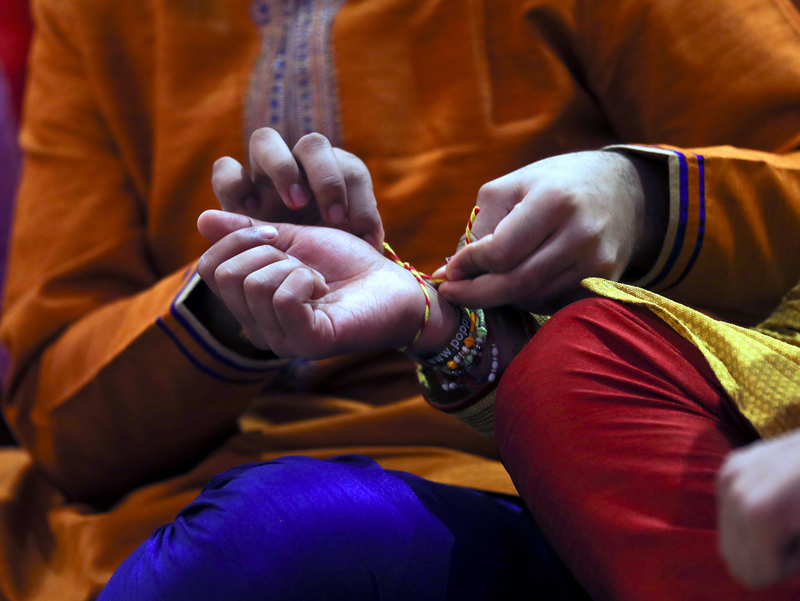 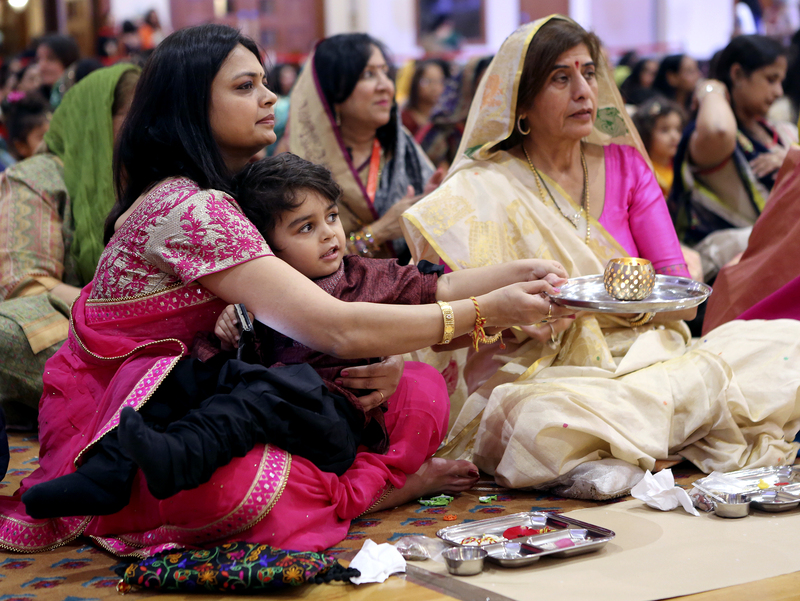 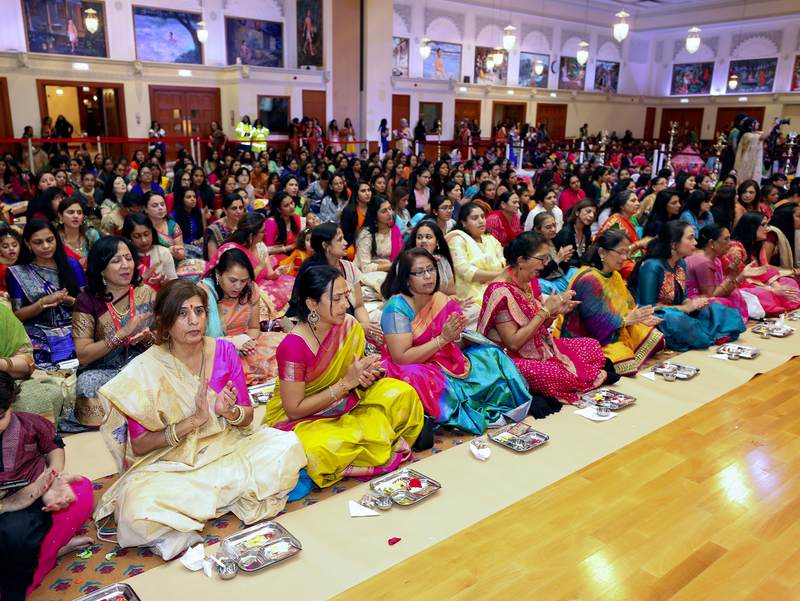 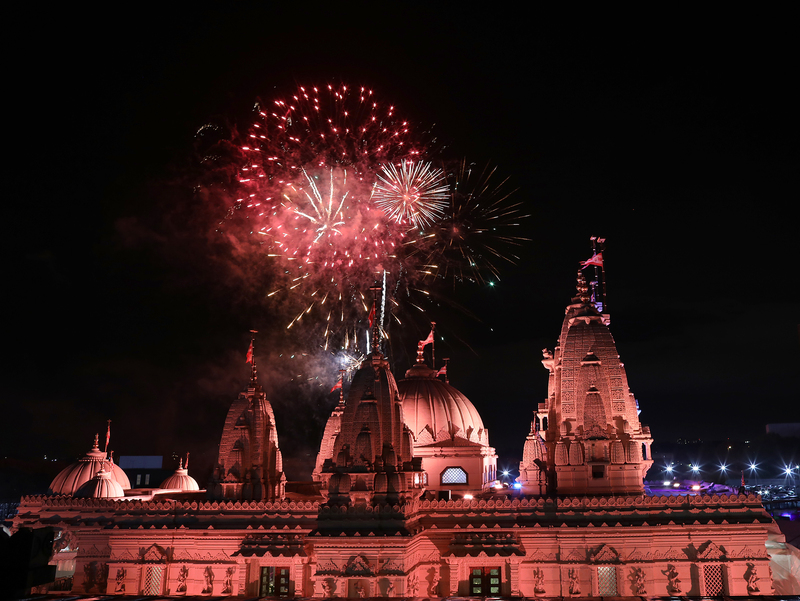 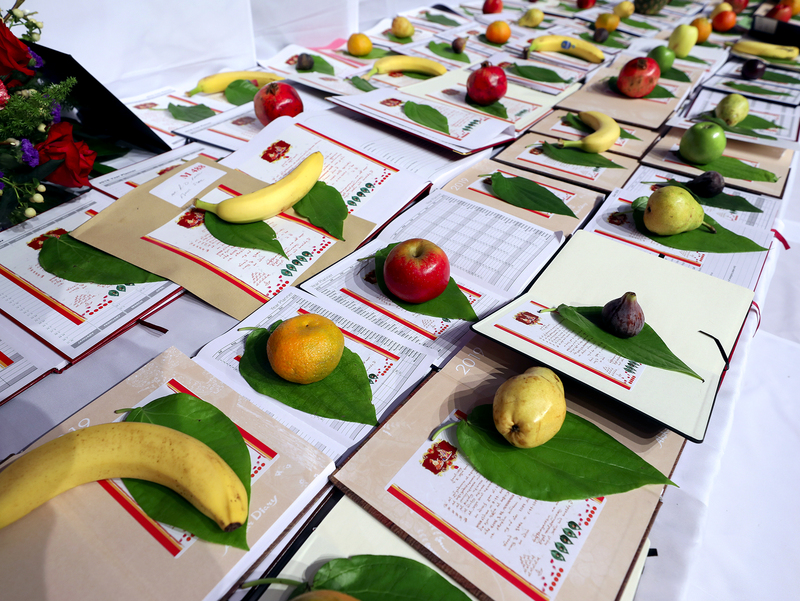 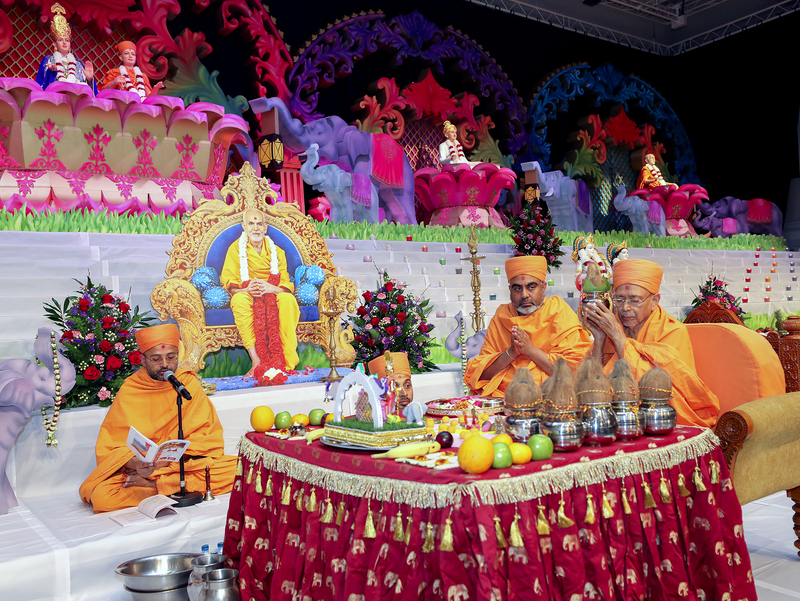 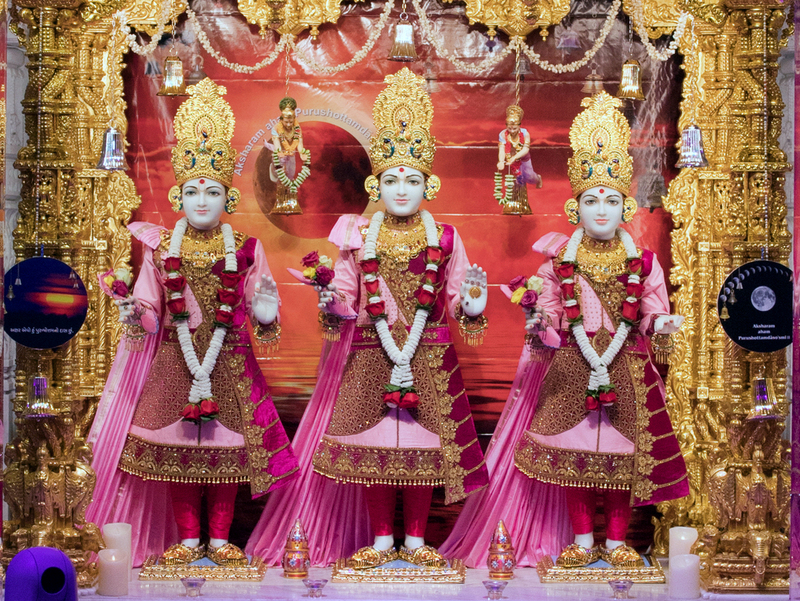 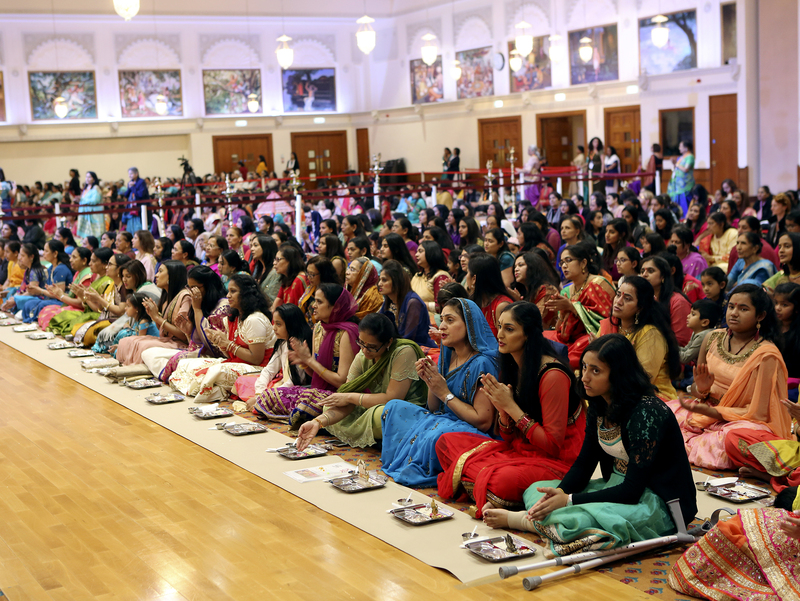 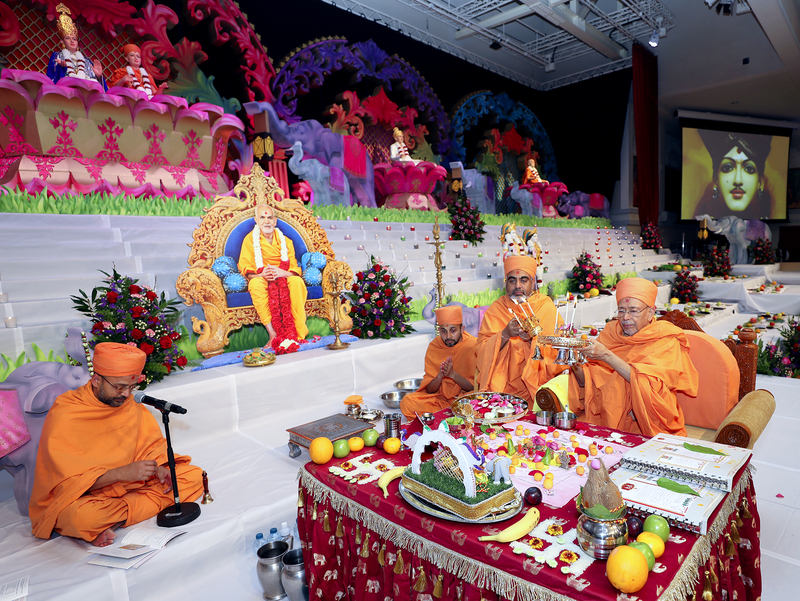 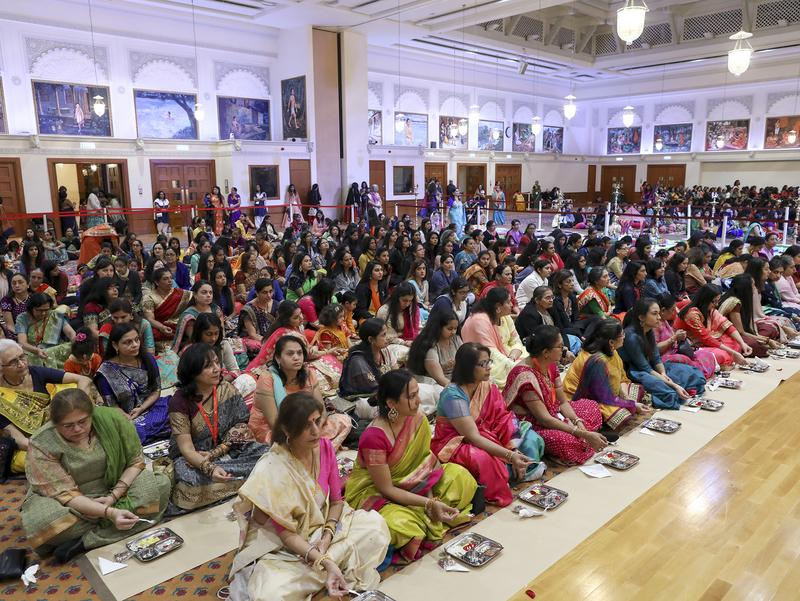 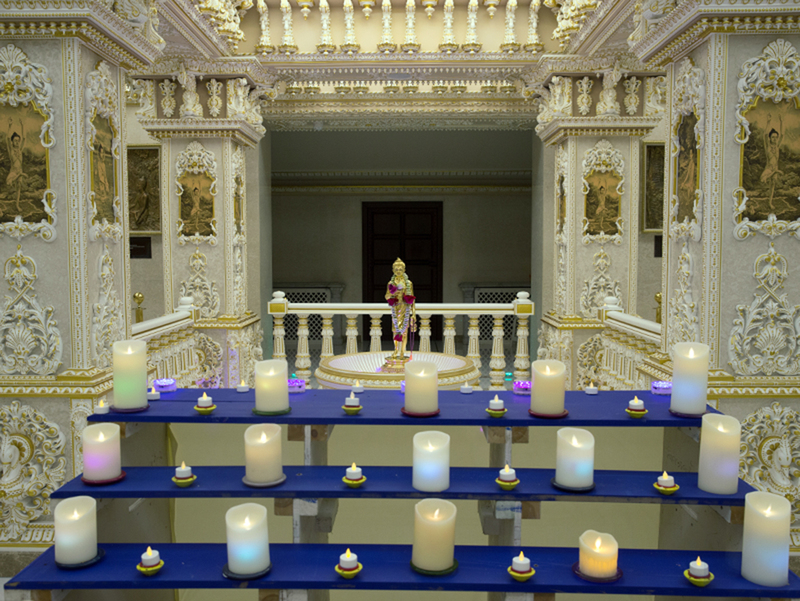 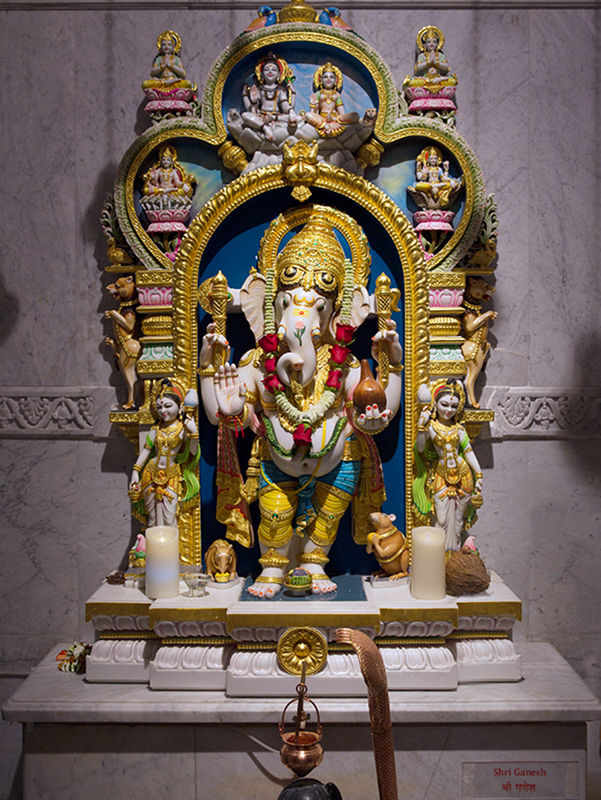 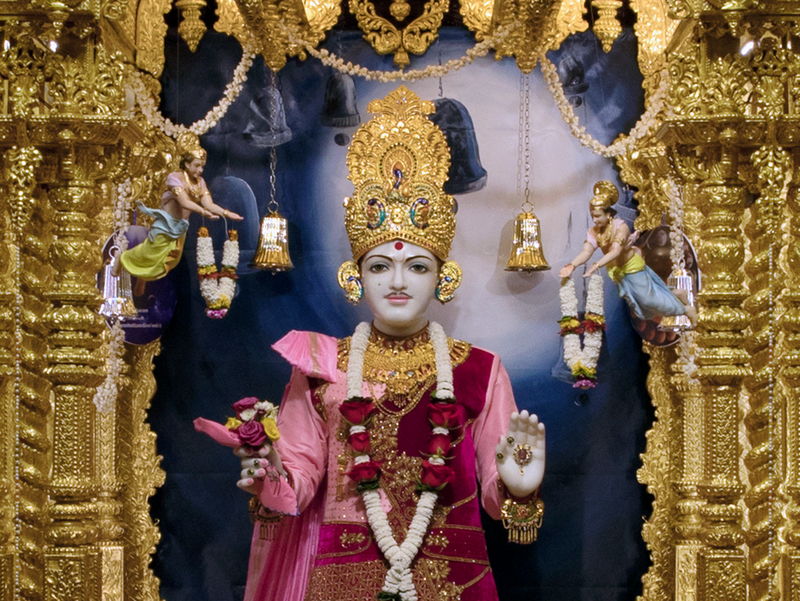 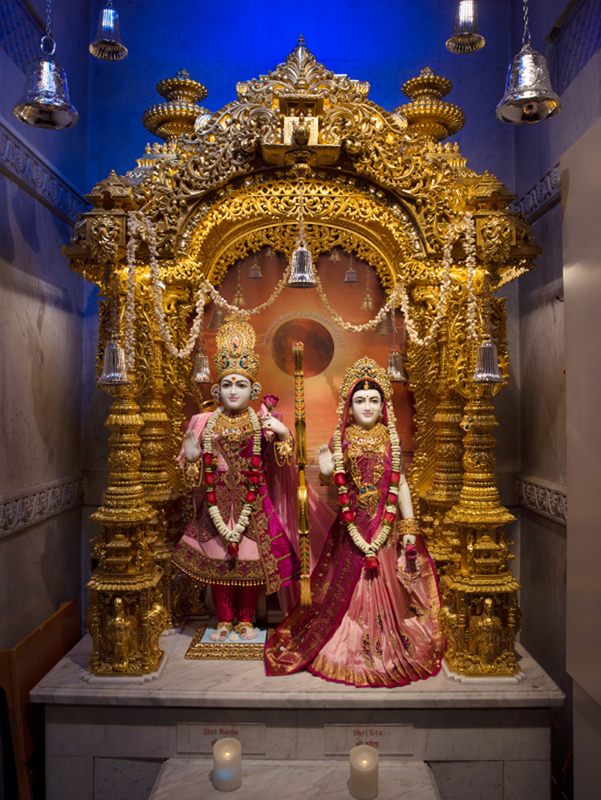 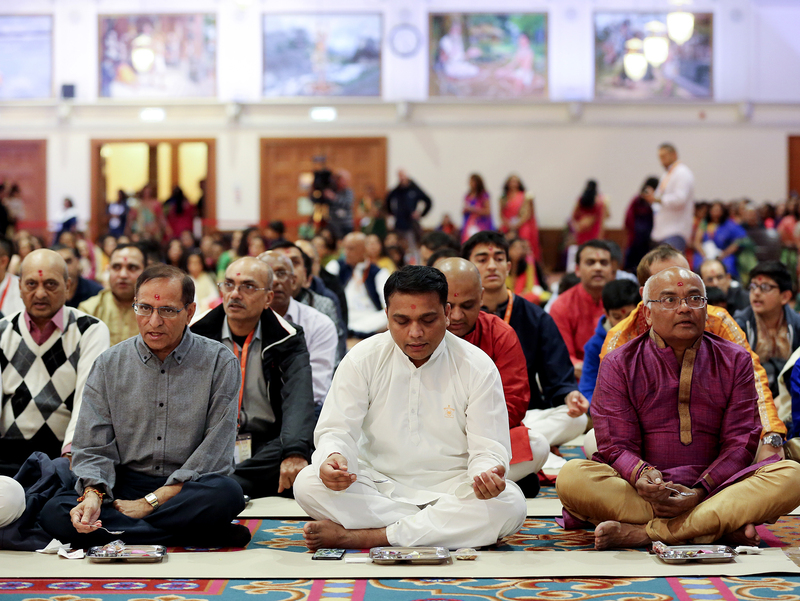 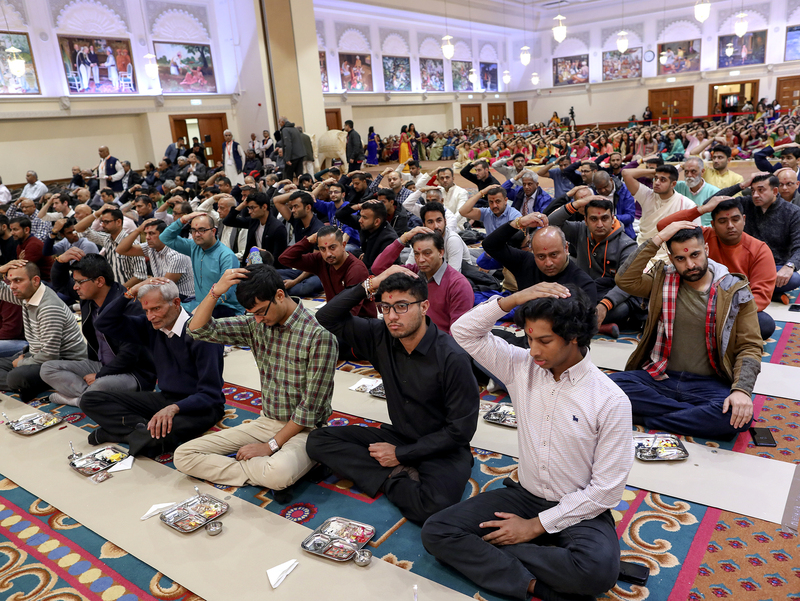 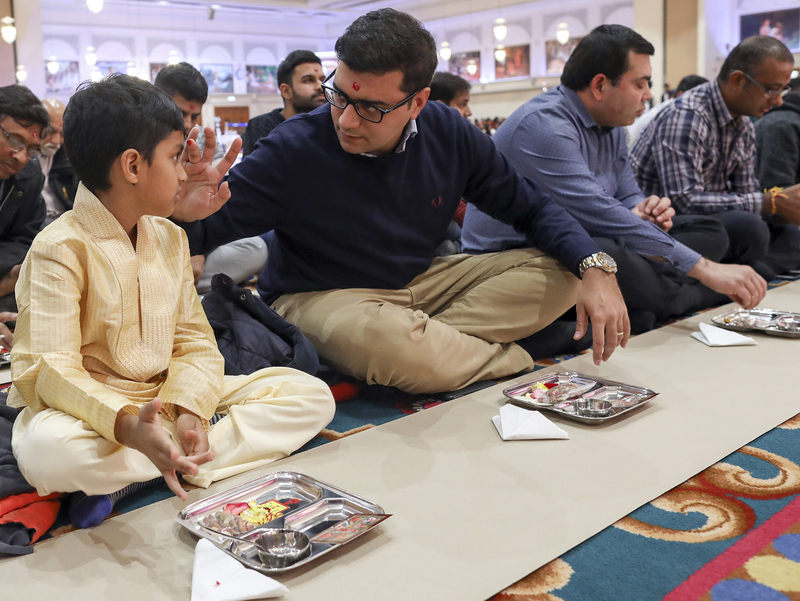 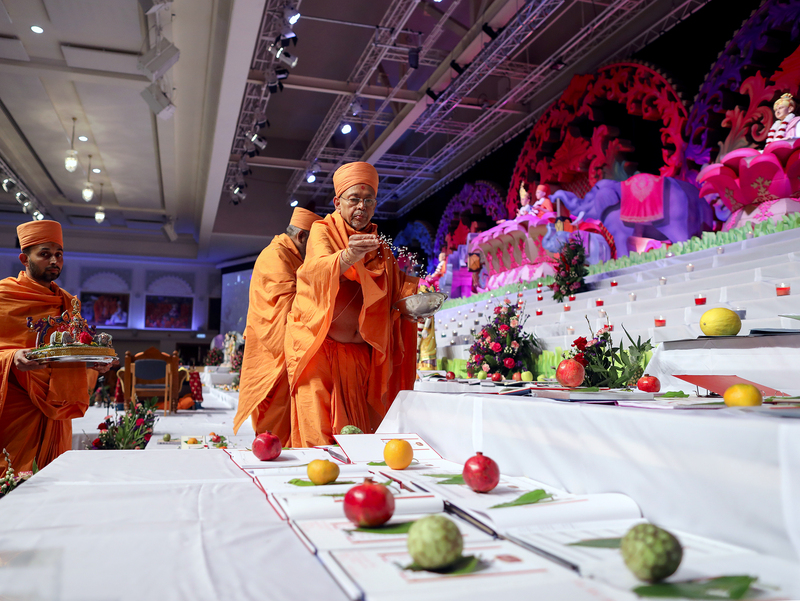 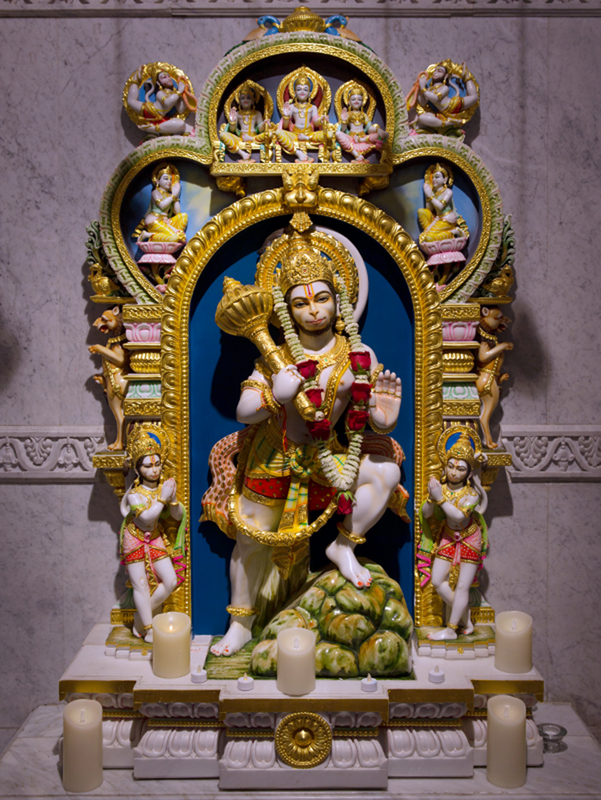 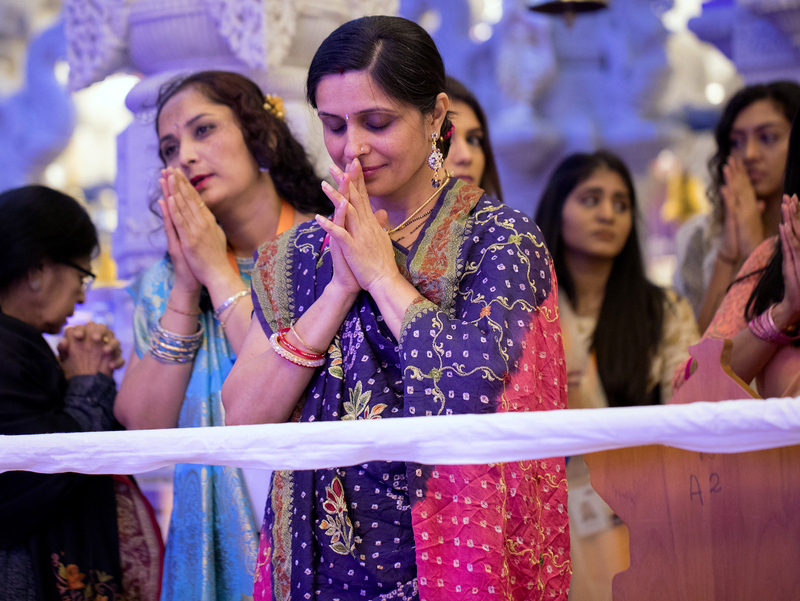 BAPS Shri Swaminarayan Mandir, London, welcomed tens of thousands of people to celebrate the traditions, colours and rich culture of Diwali on Wednesday 7 November 2018. 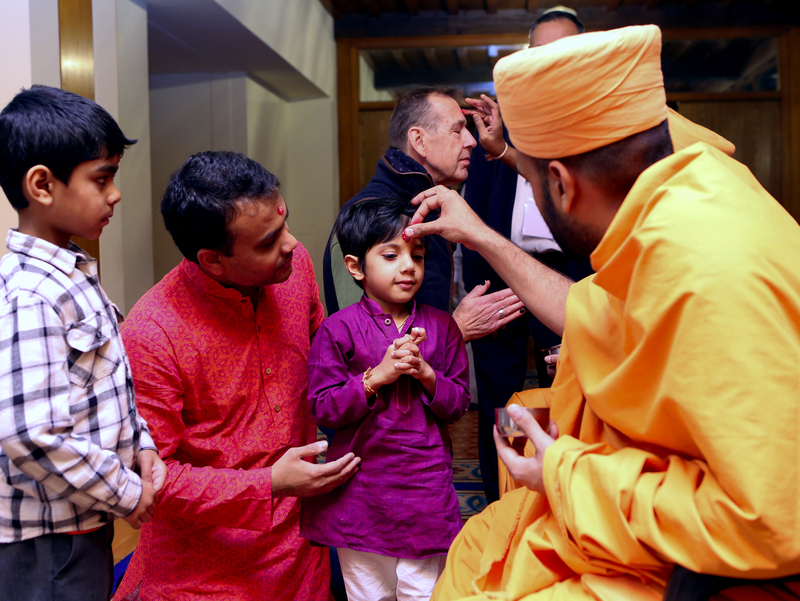 Visitors arrived throughout the day to offer their prayers and respects. 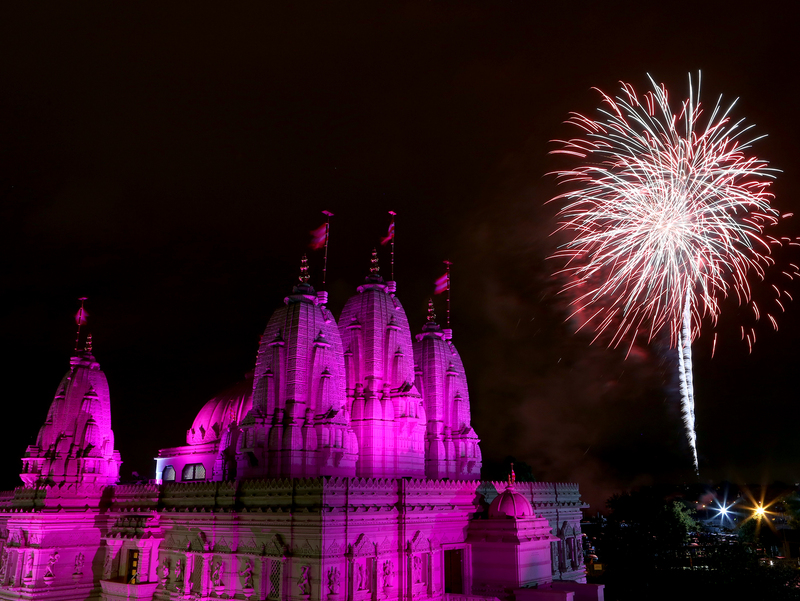 Diwali at the Mandir is a community celebration, reinforcing charity, goodwill, family values and the love of God. 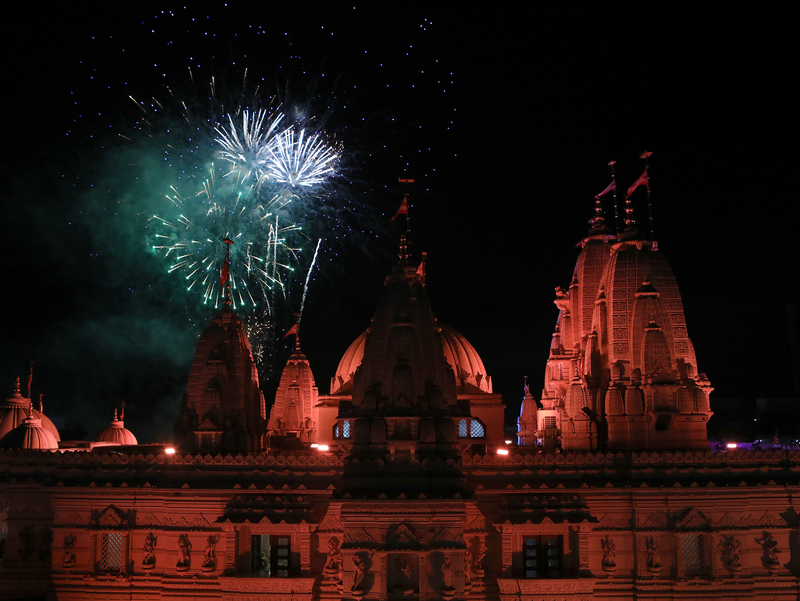 Diwali is one of the most auspicious dates in the Hindu calendar. 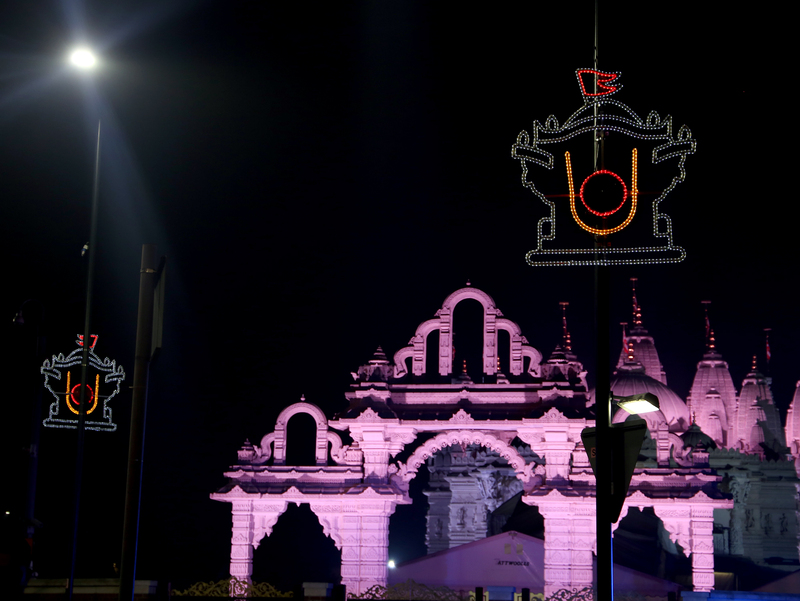 It is also known as the ‘Festival of Light’ because devotees light rows of lamps symbolising the triumph of good over evil. 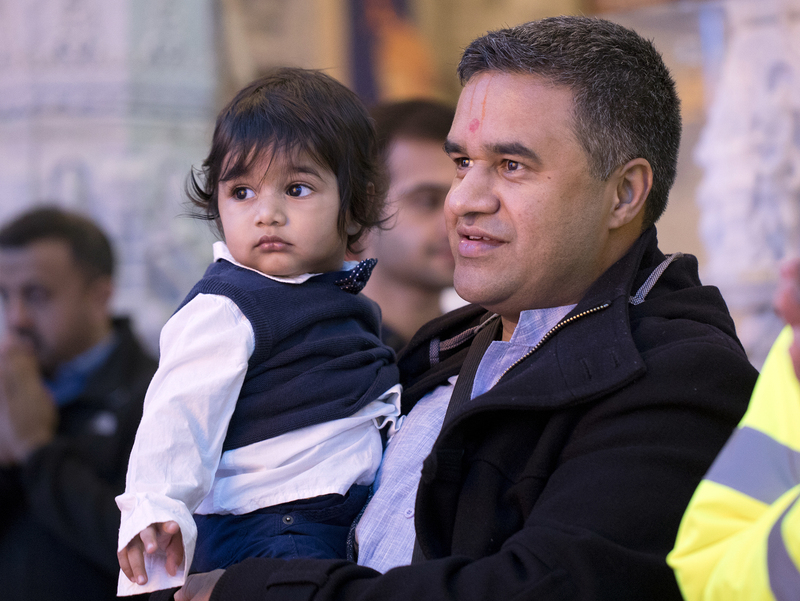 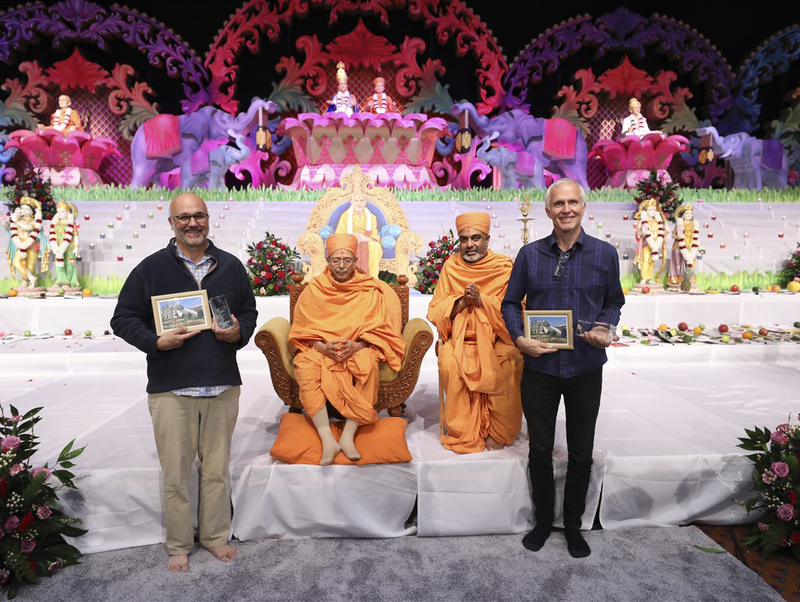 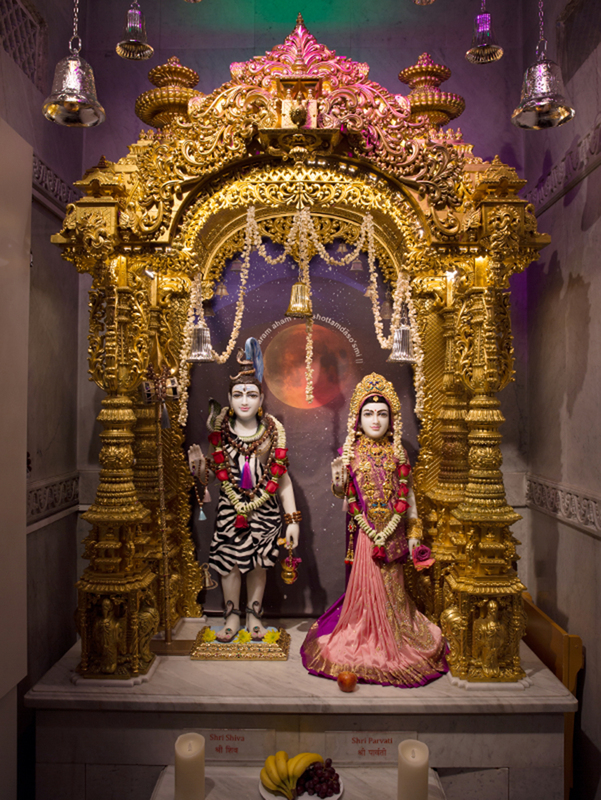 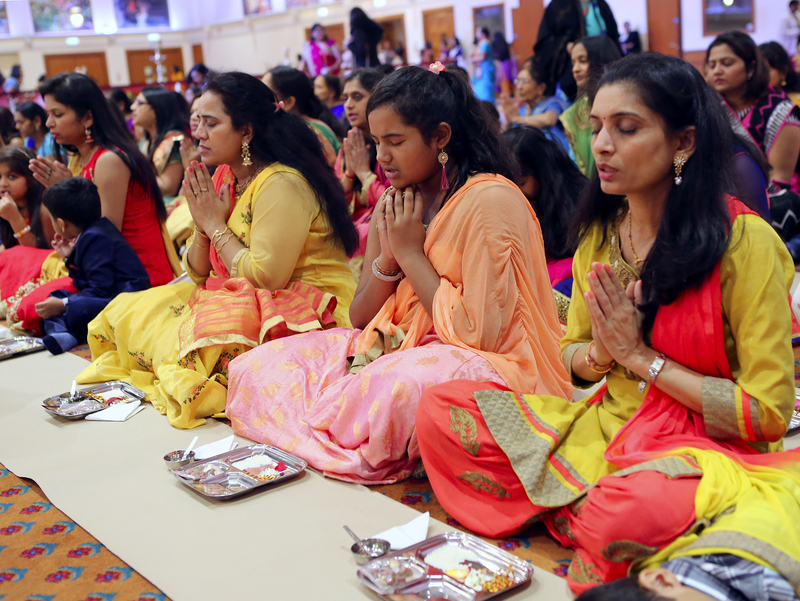 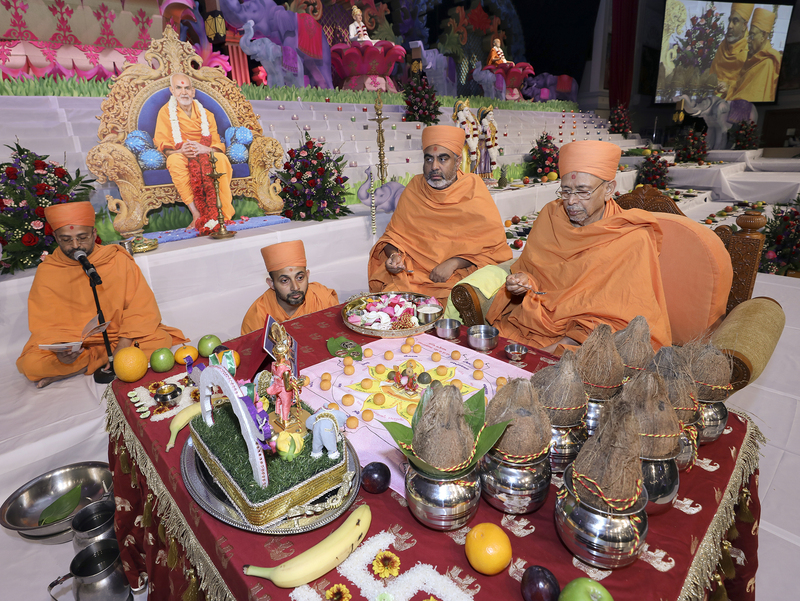 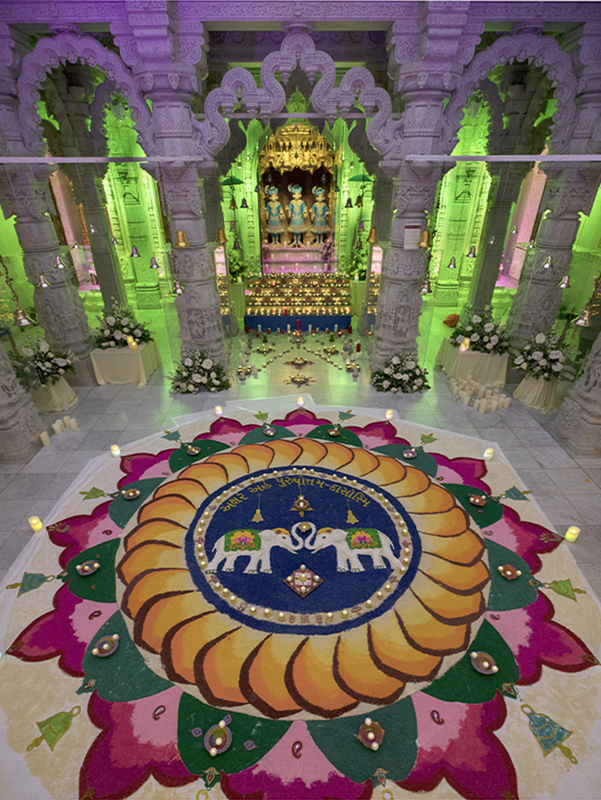 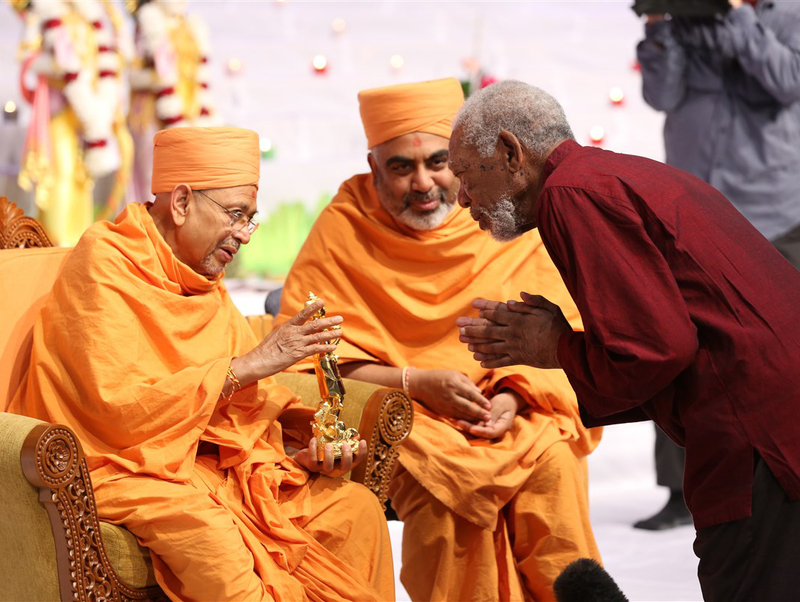 The celebrations at the Mandir – the largest in the country – included a special ceremony in the evening in the presence of Sadguru Pujya Tyagvallabh Swami, a senior swami visiting from India. 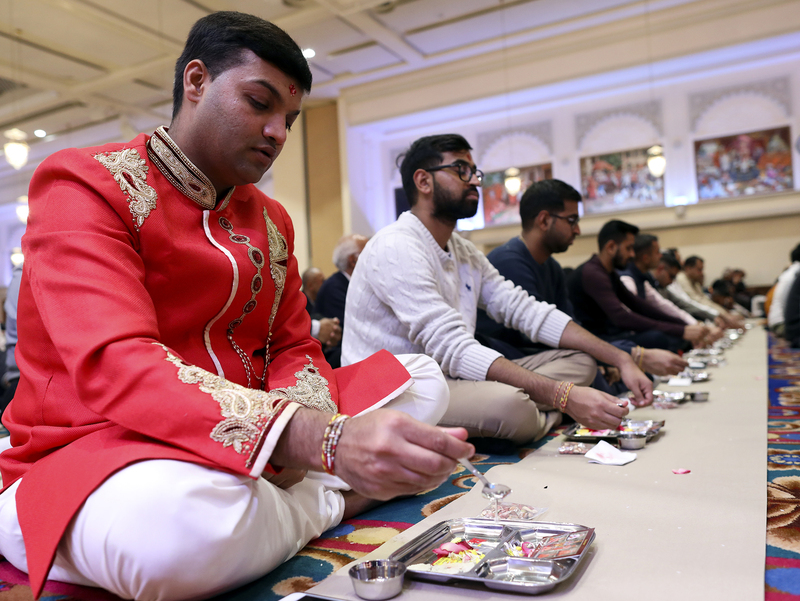 During the ‘Chopda Pujan’ ritual, business owners closed their existing ledgers and opened new ones in preparation for the year ahead. 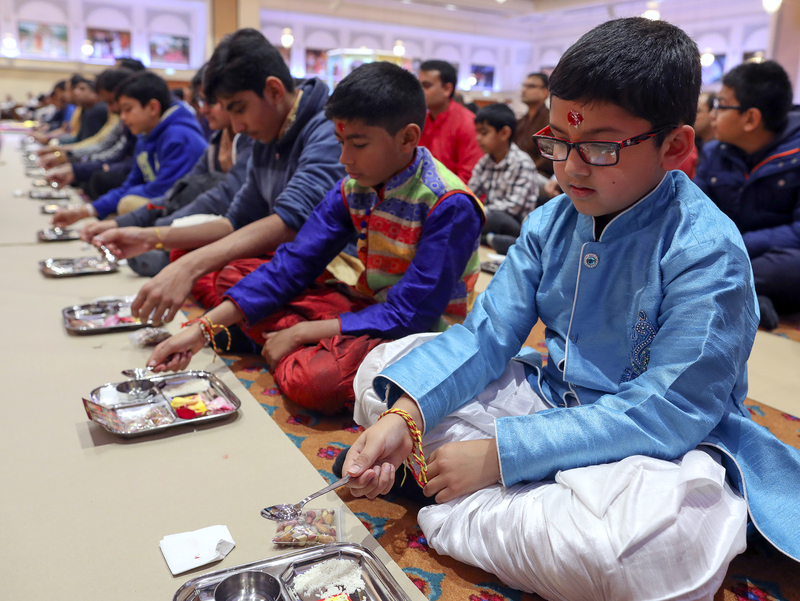 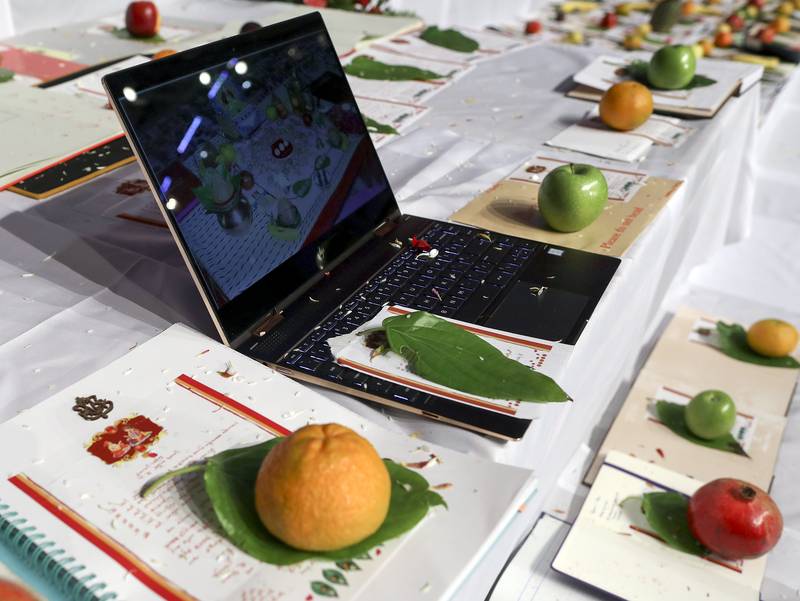 Students similarly sanctified their textbooks and notebooks. 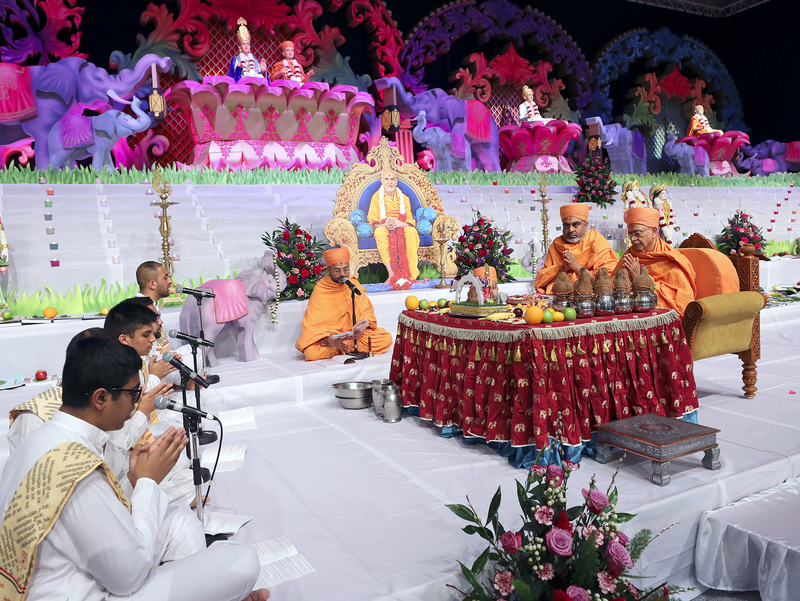 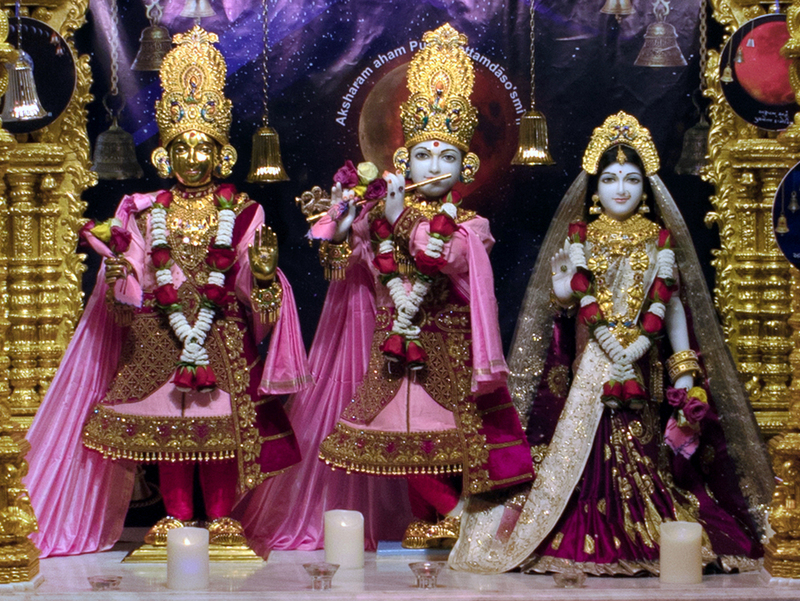 The ceremony also symbolises how one should take stock of one’s spiritual relationship with God. 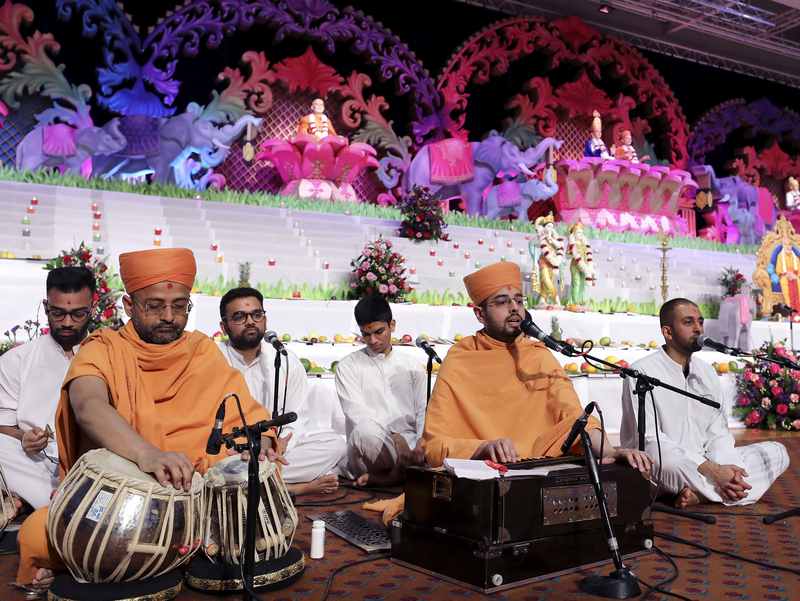 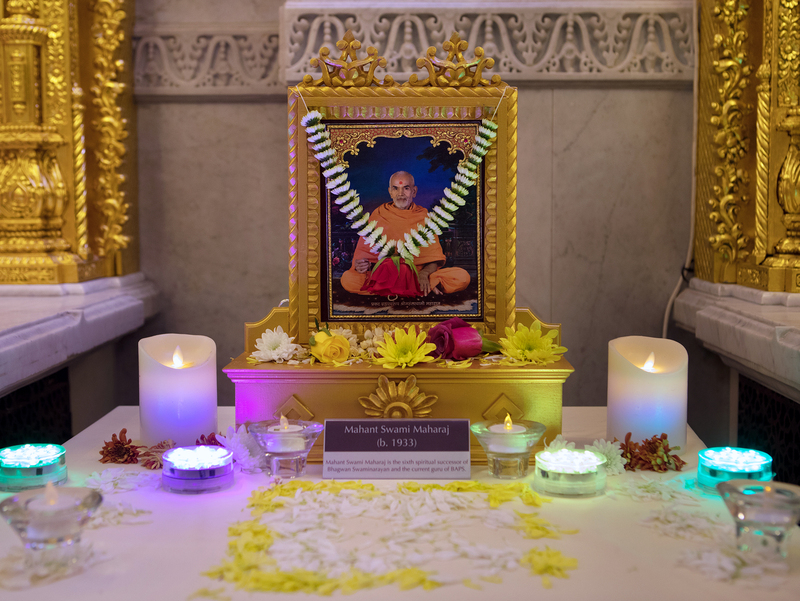 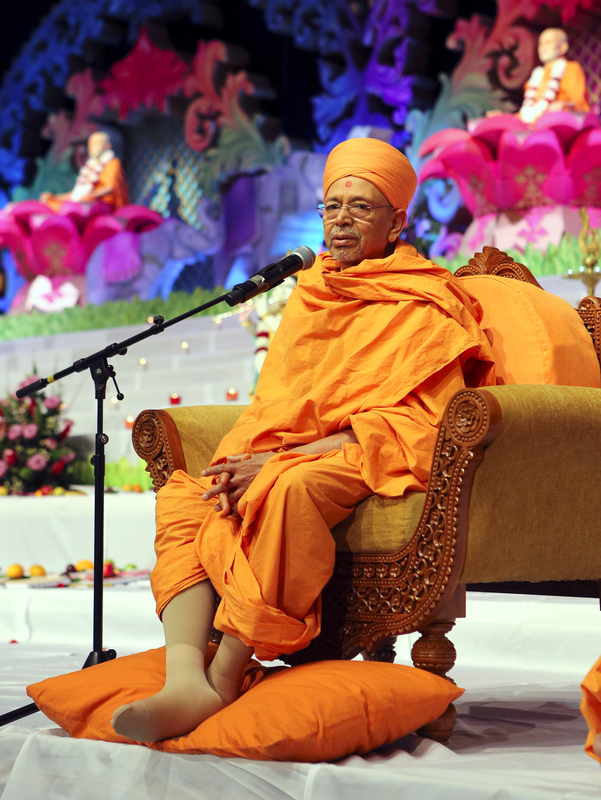 Video highlights of Mahant Swami Maharaj’s visit to the UK in 2017 were then shared with the congregation, rekindling cherished memories for young and old. 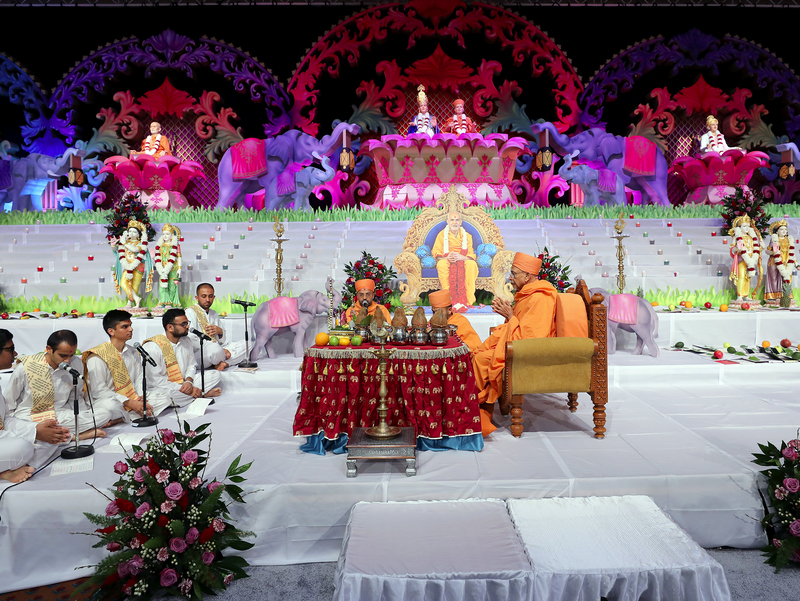 Tyagvallabh Swami wished everyone a ‘Shubh Deepavali’ and prayed that one and all may become spiritually enlightened. 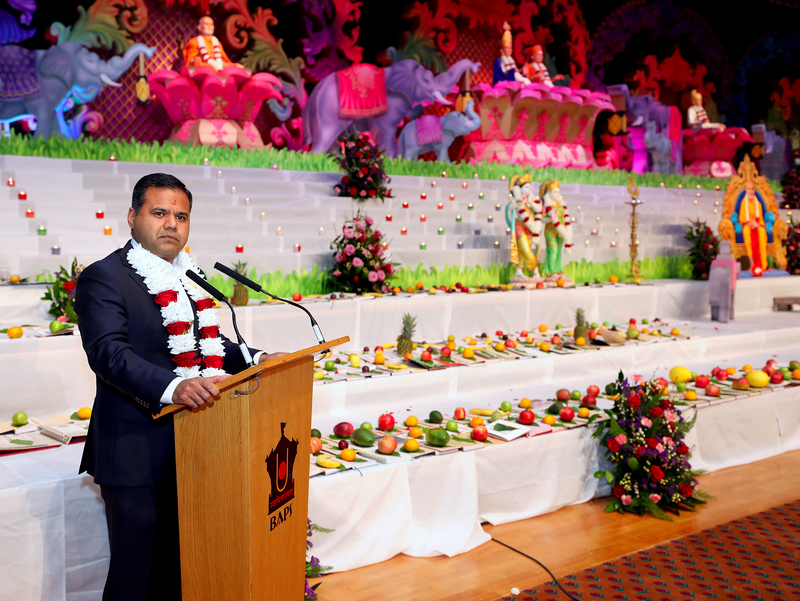 Also present during the festivities was Ramesh Agrawal, Deputy Mayor of London, who thanked the congregation for its warm welcome and the Hindu community in London for its valuable contributions. 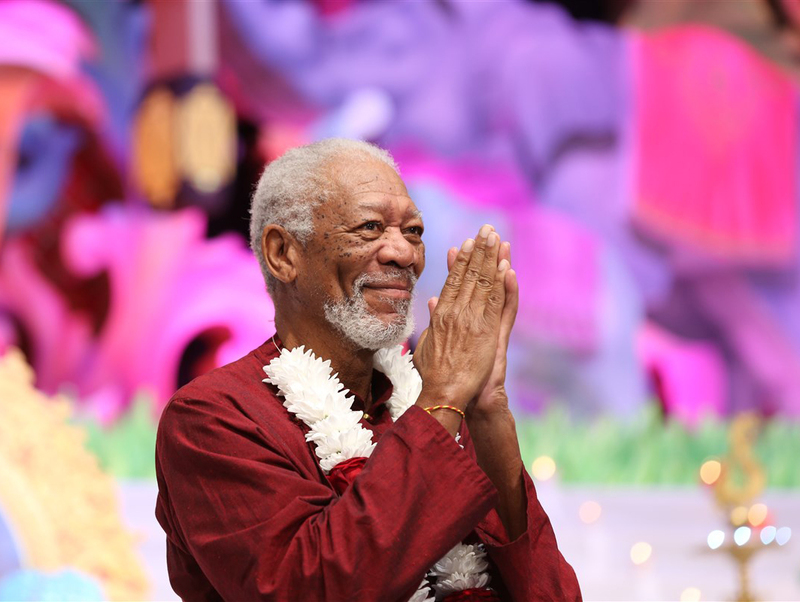 Esteemed American actor, narrator and producer Morgan Freeman was also present with a television crew from National Geographic in Los Angeles. 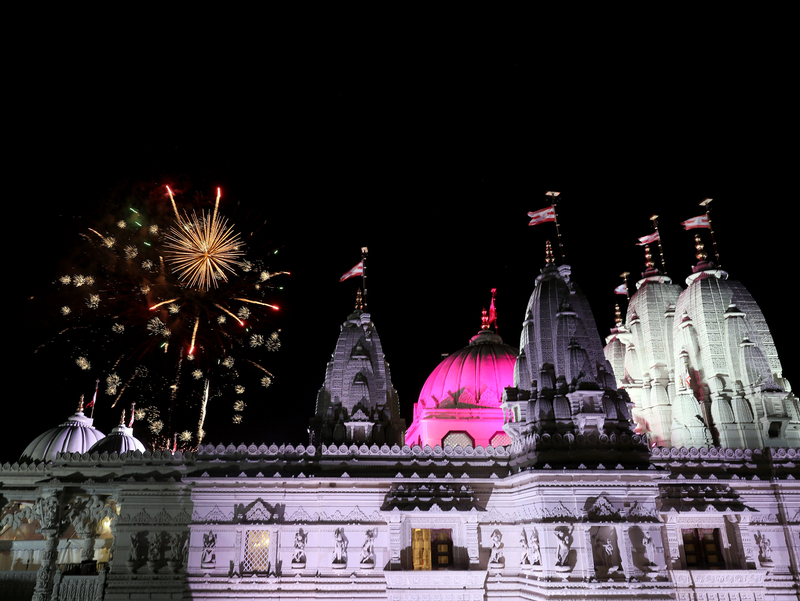 They were covering the Diwali festivities for season three of their ‘The Story of God with Morgan Freeman’. 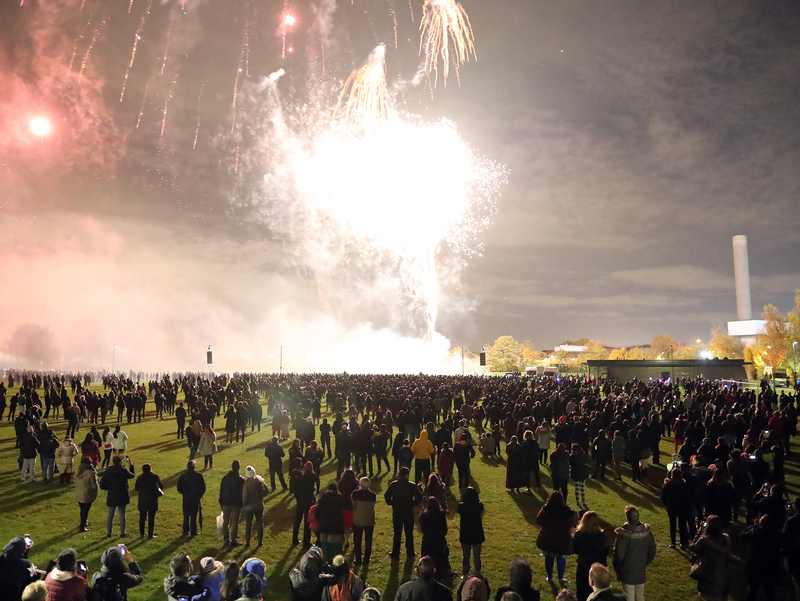 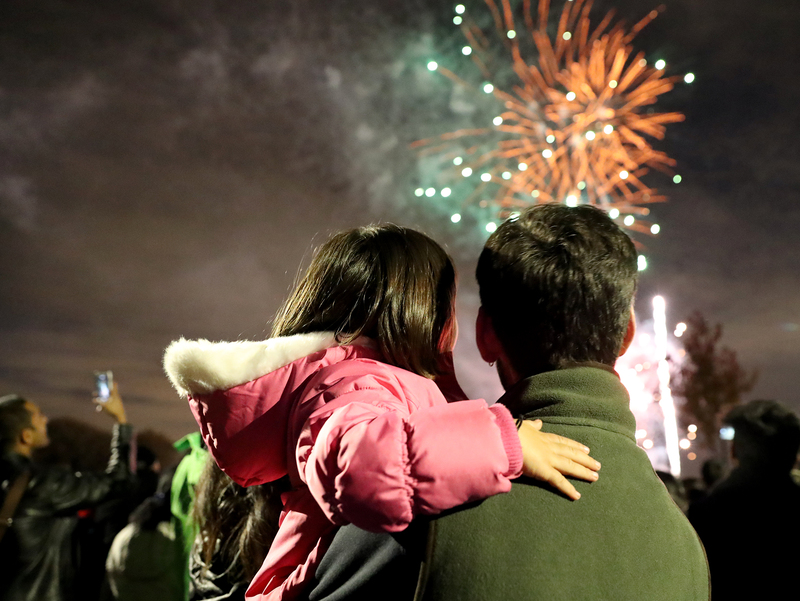 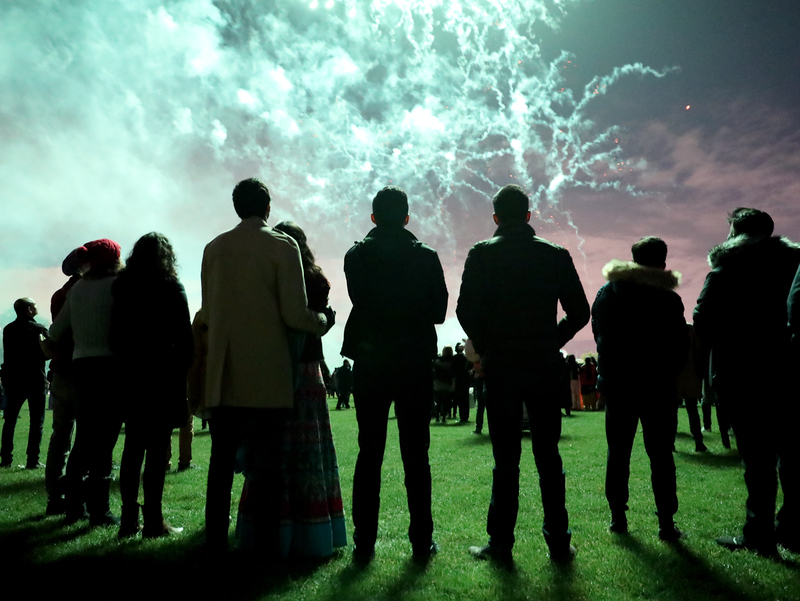 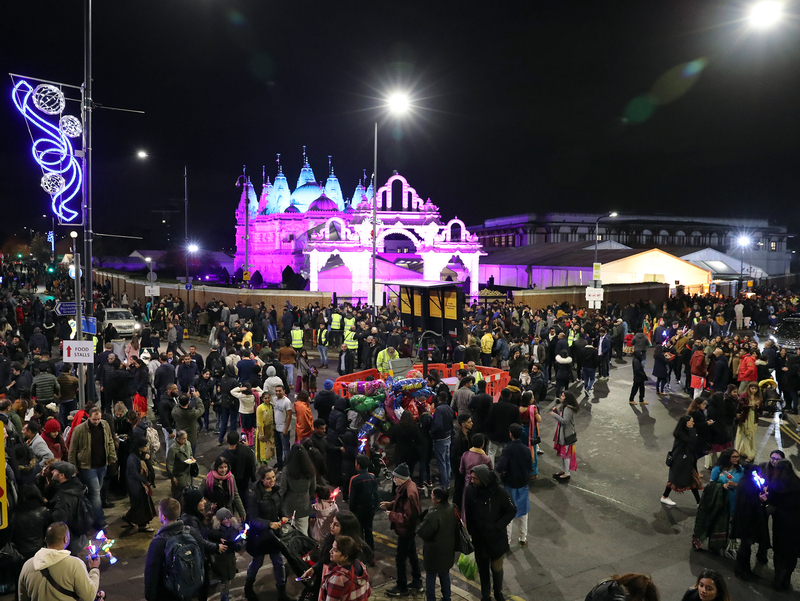 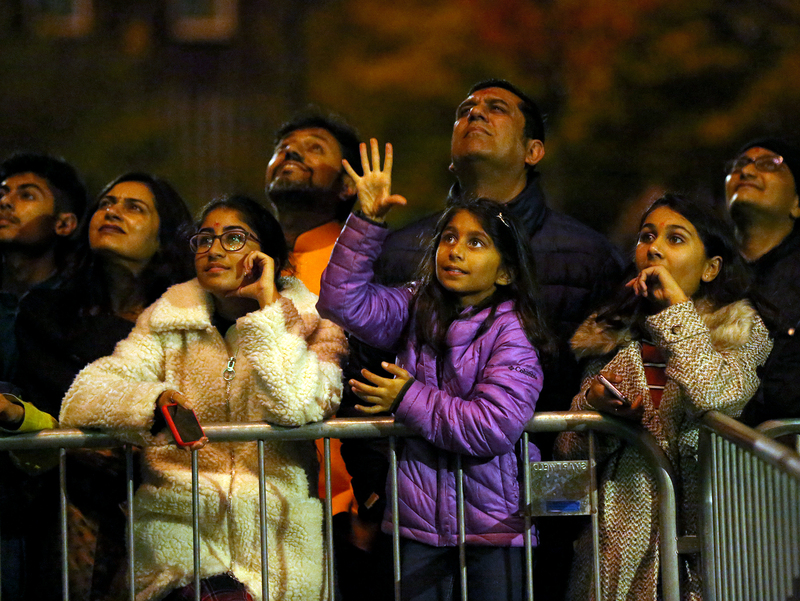 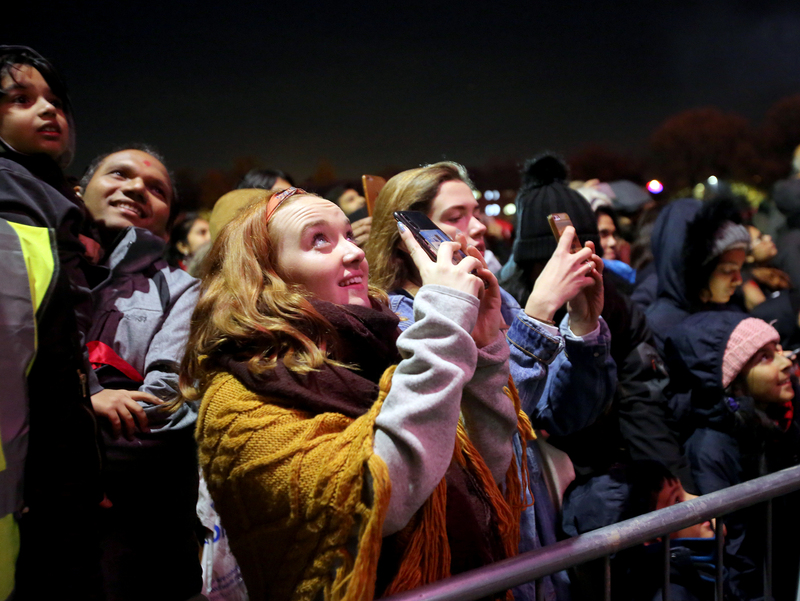 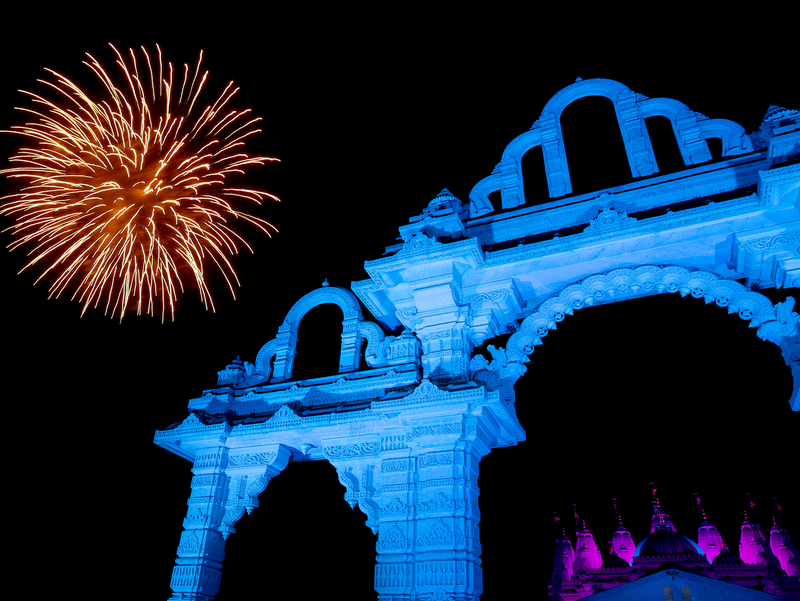 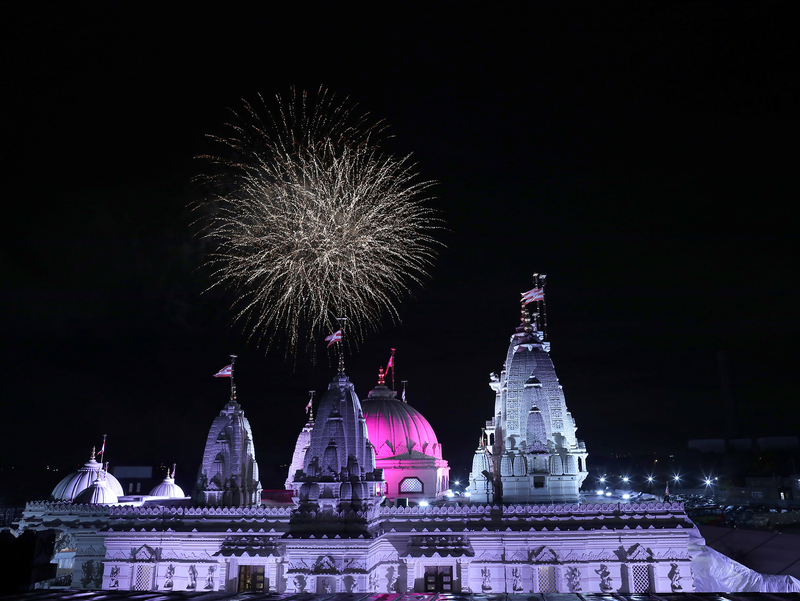 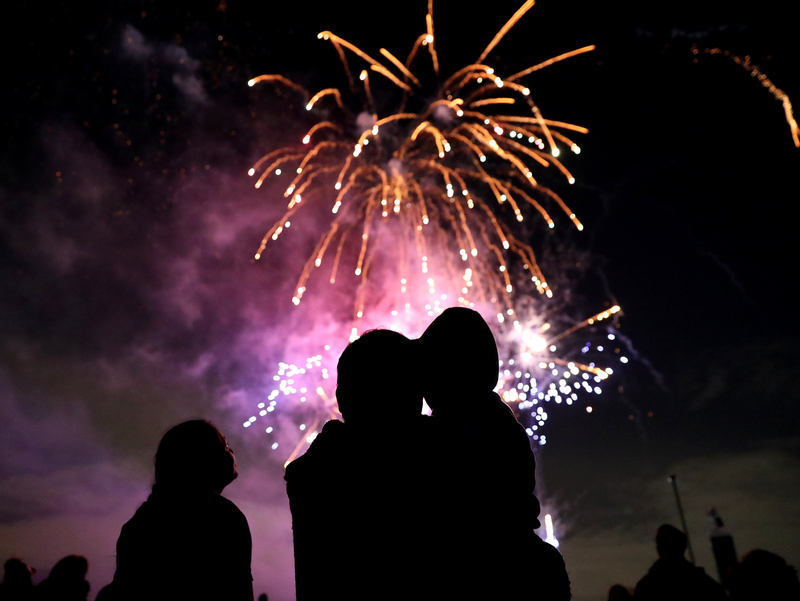 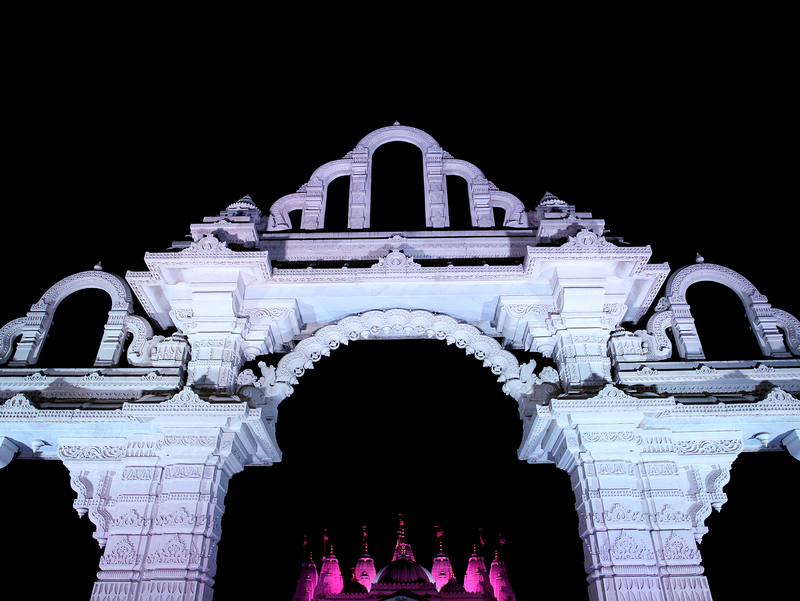 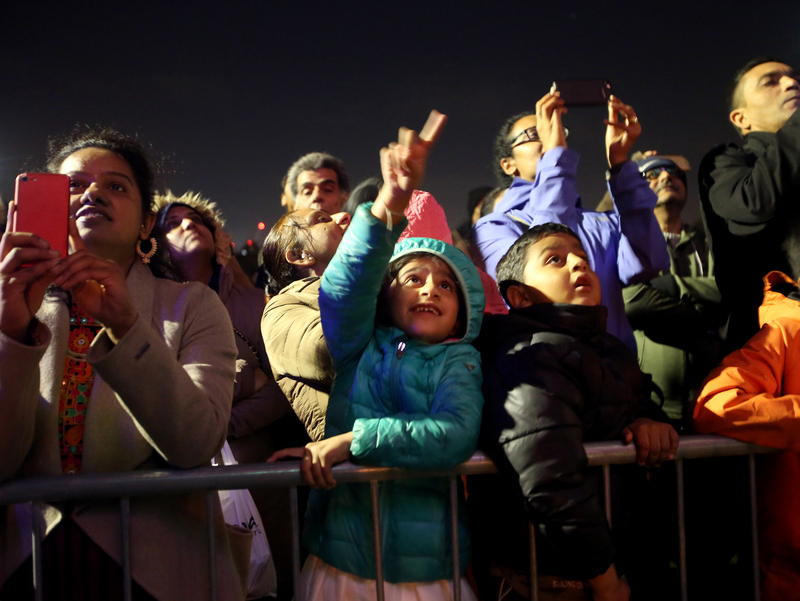 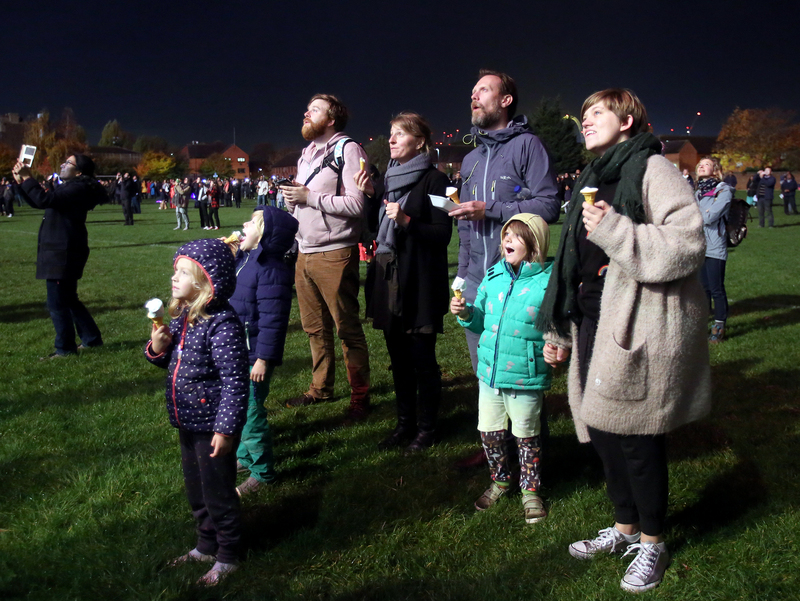 A grand fireworks display outside the Mandir brought together thousands of worshippers, visitors and members of the local community thereafter for a colourful exhibition of music and light that illuminated the skies of North London high above the Mandir domes. 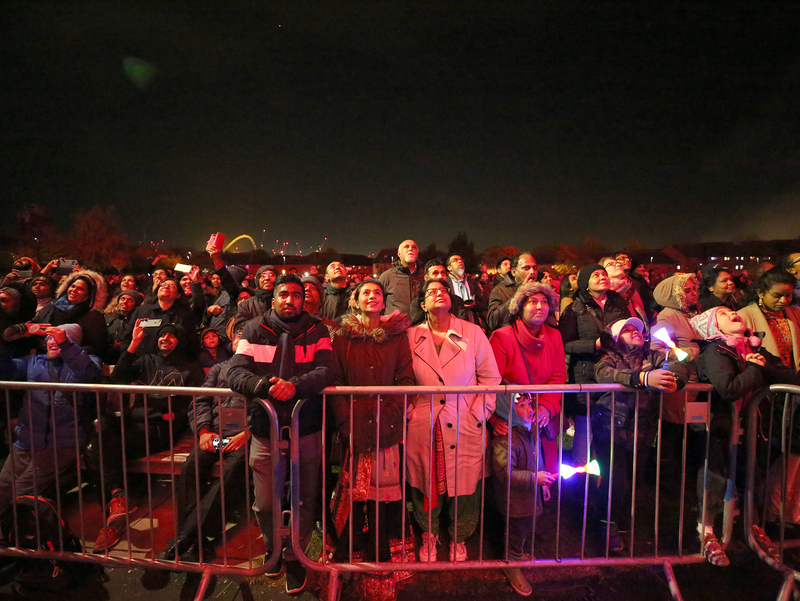 It also featured live on BBC One’s primetime The One Show. 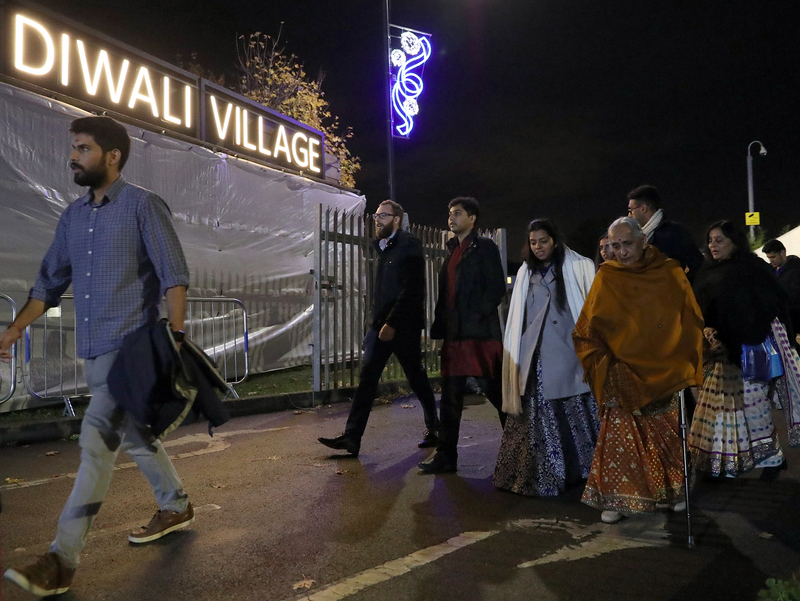 Hot delicious snacks and festive souvenirs were available from stalls at the ‘Diwali Village’ in the grounds of The Swaminarayan School (opposite the Mandir). 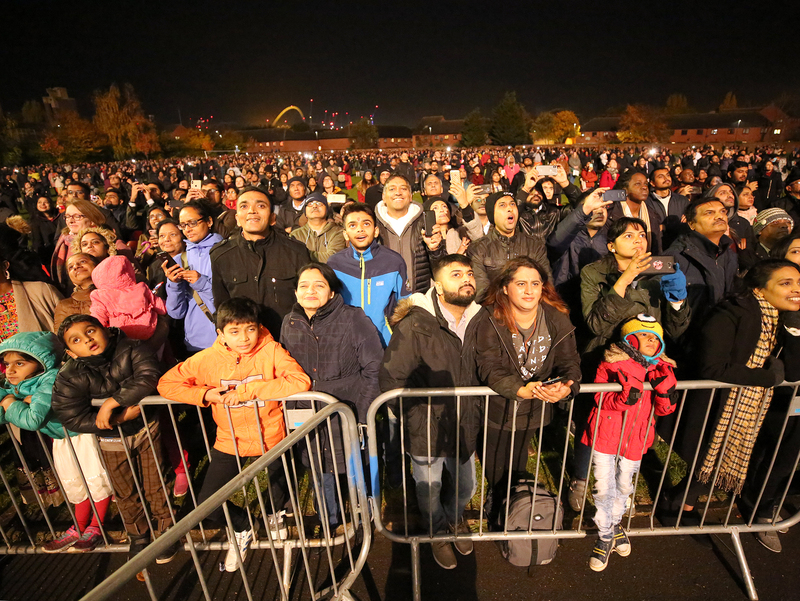 Volunteers were also on hand to shuttle worshippers and visitors to and from nearby car parks.